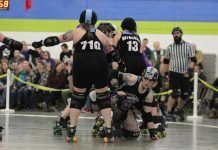 The Eves of Destruction A-Team has returned bruised and exhausted but determined, after an impressive showing at Prince George’s Northern Exposure Roller Derby Tournament which features some of the best derby players from Western Canada and across the border. The A-Team went 1-3 on the tournament winning their first game 281-101 against Central Washington’s Rodeo City Rollers, and losing their next two against Prince George’s Rated PG Rollergirls 175-133 and against Greater Vancouver’s Anarchy Angels 179-168. Pfury S. Pfaff adds Prince George put on a fantastic derby tournament giving them the opportunity to play against some great teams. 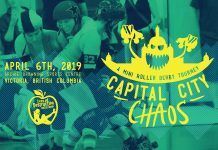 Your next opportunity to see roller derby in Victoria will be May 19th: The Eves’ The Rotten Apples face the Saltspring Tempest and the Eves’ Hard Cores play the Washington State’s Aftershocks Roller Rebels. Tickets are available online for $10 in advance or are $15 at the door. All 2018 events are family friendly (kids under 10 are free! ), include a beer garden, halftime events, vendor village and TWO games full of hard hitting action!